Many people brought these difficult negotiations forward during the last decade and we would like to thank all of them - as we would like to thank the International Atomic Energy Agency for its critical contribution and close cooperation as well as the Austrian government for the support and hospitality. 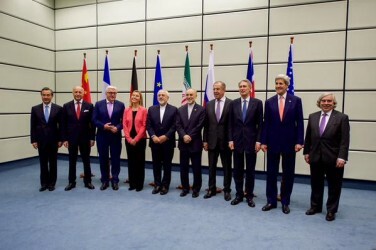 We have today agreed on the final text of this Joint Comprehensive Plan of Action The E3/EU+3 and the Islamic Republic of Iran welcome this historic Joint Comprehensive Plan of Action (JCPOA), which will ensure that Iran’s nuclear programme will be exclusively peaceful, and mark a fundamental shift in their approach to this issue. They anticipate that full implementation of this Joint Comprehensive Plan of Action will positively contribute to regional and international peace and security. Iran reaffirms that under no circumstances will Iran ever seek, develop or acquire any nuclear weapons. The Joint Comprehensive Plan of Action comprises of a main text, and five technical annexes - on nuclear, sanctions, civil nuclear energy cooperation, a joint commission, and implementation. These documents are detailed and specific: that is important because all sides wanted clarity so as to ensure the full and effective implementation of the agreement.